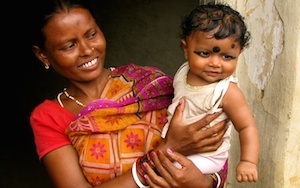 The Better Improving and the Weak Faltering: The Story of Infant Mortality Across the Indian States. Despite the huge infusion of funds in NRHM, there is a national disparity in infant health.None of the poorly performing states were able to achieve a rate of decline in Infant Mortality Rates (IMR) close to what the best performing states have achieved between 2006 and 2012.The following visualization compares IMR in 2006 with IMR 2012 for 21 major states. Note: IMR refers to the number of deaths of children less than one year of age per 1000 live births. 3 out of 4 states achieved a decrease of 29% or more. None of the four states with the highest IMR achieved a decrease this rapid. There is a difference of almost 10 percentage points between the average decrease in IMR achievedby top 4 states (33%) vis-à-vis the decrease achieved by bottom 4 states (24%).